Summary: Thirteen year-old Kate lives with her two brothers and mother on a farm. With a father who has left them to pursue a career in race car mechanics, everyone on the farm is working to hold things together as a couple mortgage payments slip by unpaid. Kate’s mother is working seven days a week at a dairy farm to make ends meet, and Kate is left to take care of her younger brother Chip while her older brother Justin considers running away. When the Walters come into their lives thanks to Sugar the goat’s need for companionship, everything starts to change. It’s a challenge for everyone involved to learn how to trust and ignore their prejudgements, but as they do they form friendships and gain family they never expected. Review: In a story reminiscent of the works of Betsy Byers and Virginia Hamilton, Rosa Jordan’s Lost Goat Lane captures the uncertainty that can come from financial insecurity. Living in Florida, Kate’s family deals with alligators, a sense of shame over the possibility of losing their farm, and a community that prejudges people based on their financial income and the colour of their skin. Jordan weaves a touching tale about a family in turmoil. Intentionally isolating themselves, Kate’s mother is struggling to keep their family home from being repossessed by the bank. To save money there are no new clothes, all food comes from their garden and goat and other luxuries like Christmas presents are just that, luxuries. Responsibility falls on Kate to keep things together at home while her mother works, and although she and her older brother work together not having a parent around does get them into trouble at times. I wanted to cry right at the beginning with the scene with the alligator. I knew something bad was going to happen but I just didn’t know what. I love how the story is about connecting though. An incident with Kate’s goat introduces her and her brothers to the Walters, neighbours they never got to know before because of prejudgements made by both families. As the friendships between the two families develop, Kate’s mother reacts badly at first, all but forbidding her children to go over to the Walters’ place. Over time though, conflicts are resolved and friends become family. Though Kate’s mother works constantly, she remains a strong parent who cares about her children and sets boundaries when needed. Although she tells them about the financial troubles they are facing, she also reassures them she will work it out and keeps her promise. My favourite parts involved the goats, Sugar and Billy. Their actions made me laugh and I absolutely loved how things ended with Sugar. Jordan’s book has a sequel, and I eagerly look forward to getting back into the world of Kate and her brothers for another story. “That’s when it occurred to Kate that maybe Booker could help explain something she couldn’t get straight in her head. 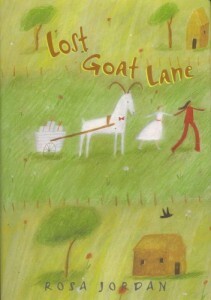 Lost Goat Lane by Rosa Jordan is published by Fitzhenry & Whiteside, (2004).